Pauline Jewett (1922-1992) was educated at Queen’s University (B.A., M.A.) and Harvard University, where she gained a Ph.D. in political science in 1949. She later taught at Carleton University in Political Science and served as Director of the Institute of Canadian Studies. Jewett was first elected as a Member of Parliament for the Liberal Party in 1963. She rose to national prominence when she quit the Liberal Party on priniciple in 1970 following the implementation of the War Measures Act and joined the New Democratic Party. In 1974, she became president of Simon Fraser University, and was the first woman president of a Canadian co-educational university. She returned to Parliament as an NDP member in 1979 and remained in politics until 1988. 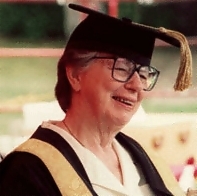 Jewett was installed as Chancellor of Carleton University in 1990, a position she held until her untimely death from cancer in 1992. Throughout her life, she was committed to many social justice causes and was a strong and vocal advocate of equality for women. For more information on Jewett’s remarkable life, consult Judith McKenzie, Pauline Jewett: A Passion for Canada , Montreal & Kingston: McGilll-Queen’s University Press, 1999.